More than 20 people are feared dead after storms and tornadoes struck the central US states of Kansas and Missouri, leaving an extensive trail of damage. Homes were ripped to pieces and in some areas "tornadoes were staying on the ground for an extensive period," KMBC television's Jeremy Hibbird in Kansas City told the BBC. In some places a trail of destruction about a quarter of a mile (400 metres) wide was left behind after what locals described as the worst storms in years. Eyewitnesses have e-mailed BBC News Online with their accounts of the storms which bent metal pylons "like toothpicks". At least four tornadoes hit eastern Kansas on Sunday afternoon local time before heading into neighbouring Missouri, officials said. Roofs were torn off houses, and trees snapped like matchsticks, witnesses said. The tornadoes were part of a large storm system that hit the Mid-West, also affecting South Dakota, Nebraska, Tennessee and Arkansas. Some of the worst-hit areas were on the Kansas and Missouri border. The Kansas authorities have declared seven counties disaster areas, and Missouri is taking similar action. 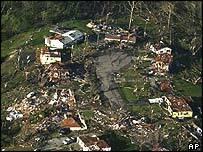 Missouri Governor Bob Holden said the damage was the worst he had seen from a tornado in several years. The National Guard has been told to be ready to go to storm-damaged areas in Missouri and emergency shelters are being opened. The tornadoes were believed to have resulted in 12 deaths in Lawrence County, Missouri - one of the worst affected areas - according to the local sheriff. A number of people taking shelter in a National Guard Armory in Pierce City were missing after it was destroyed, and the town centre was described as having been "wiped out". D Fokum, who lives in Parkville, Missouri, e-mailed News Online to describe how two tornadoes cut a swathe of destruction through the town. "I heard a second tornado siren after the first one went through," he wrote. "First we had some table tennis ball-sized hail, and then the wind, then it was over. The brunt of the storm struck the southern end of Parkville, near Riverside. This morning I saw a propane dealership completely destroyed, as well as some power pylons that were bent like toothpicks." "Two hours later when we arrived on the outskirts of the city, debris littered the highway. Trees, shingles, insulation, paper covered the freeway like snow. "Most schools in the northern half of the city are closed including William Jewell... arts college... The campus is a wreck and several dormitories are destroyed." Dozens of people were treated in hospitals for injuries, power lines were down in some areas and Kansas City international airport was evacuated and closed briefly. Severe weather and tornadoes are typical in the region in April, May and June, when cool air from the north collides with moist air from the Gulf of Mexico, Joy Moser of the Kansas Emergency Management Agency said. Tornadoes are much smaller than hurricanes, ranging from just 10 metres to - in extreme cases - over a kilometre in diameter. They are usually about 100 metres across. Tornadoes usually last only a few minutes or an hour at most - though in this time they can rampage over 200km. The damage they cause is due to the ferocity of the winds at their centre, which can destroy buildings and pick up debris - including human beings and animals. Were you affected by the tornadoes? Do you live close to any of the affected areas? Send us your comments. "They call this part of America tornado alley"